There are A LOT of cocktail competitions out there. One after the other, brand after brand, city after city, country after county, nice cash prize after nice cash prize. 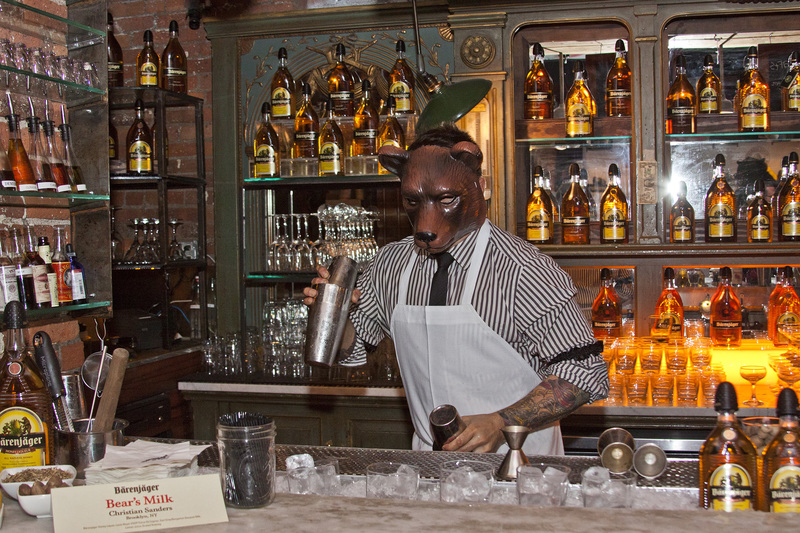 But one annual competition that deserves some special attention is the 4th Annual National Bärenjäger Bartender Competition (www.barenjagerhoney.com). Why? Because this was the first of all the cocktail competitions to include an audience participation voting component, setting itself apart from all the rest. And, it just may be the only branded cocktail competition that welcomes amateurs as well as professional bartenders to compete. To build awareness of the competition salespeople hand out fliers in their regions and press outlets (like this one) mention the competition in hopes of drumming up entrants who will have their recipes blindly judged by the likes of Dushan Zaric (Returning judge and founder of award-winning Employees Only and Macao Trading Co.), Jim Meehan (Managing Partner of PDT in NYC and author of The PDT Cocktail book), Sean Kenyon (Third generation barman and proprietor of Williams & Graham in Denver, CO), and Tricia Alley (Director of Mixology for South California at Southern Wine & Spirits and USBG LA Chapter President). For your chance to win this year’s contest which welcomes professional and amateur mixologists from across the country to submit their most innovative cocktail creations incorporating Bärenjäger Honey Liqueur or Bärenjäger Honey & Bourbon check out: www.BarenjagerHoney.com and complete the online registration form by August 23, 2013. Must be at least 21 years of age to enter. No purchase necessary. The official rules and regulations can also be found on this site. Know that the judging panel, which includes esteemed industry tastemakers and a surprise celebrity judge, will score all submissions prior to selecting the top six recipes to move on to the final round. Finalists will mix off at a private event at The Houston Hall for media and industry influencers on September 16th in New York City for a grand prize of all-expenses paid trip to “BEARlin”, Germany and $1,000. Additionally, all guests will be asked to cast their vote for best cocktail, and the audience favorite will take home a check for $1,000 to sweeten the pot. Todd Richman, corporate mixologist at Sidney Frank Importing Company, Inc., and winner of Best American Brand Ambassador at the 2013 Tales of the Cocktail Spirited Awards, will serve as the competition’s emcee. *Contest is not open to residents of California, Texas, Hawaii and Alaska.